New Era Managing Editor Toivo Ndjebela at State House interviewing President Hage Geingob. 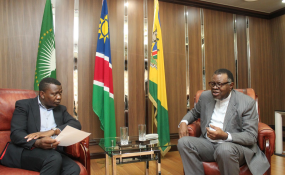 President Hage Geingob this week sat down with New Era Managing Editor Toivo Ndjebela at State House for an interview that touched on his four-year presidential journey so far, the country's public debt situation and leading the ruling party Swapo. New Era (NE): Mr President, you are four years into your Presidency. How has the journey been so far, broadly speaking? Hage Geingob (HG): Thank you very much. We are celebrating our 29 years of nationhood. Twenty-nine years after we said we're now independent people. Our Founding Father [Sam Nujoma] on that day, on 21st March 1990, said Namibia is now free forever. It means we were free to set up our own government and are responsible for our own successes and failures. My four years as President is a continuation of a legacy - I'm not starting from afresh. We have always said the legacy must continue, so I took over from where my predecessors left. You first create and maintain a good governance architecture, that is to say we must be transparent and accountable with trust to the people. As elected officials we have to be people-centered, meaning we must address their needs. The socio-economic architecture has been the most challenging one. Inequality is still growing, poverty is still there, but there are also things we have achieved. To continue the legacy, we're building infrastructure and things like schools. Our education faces enormous challenges. Having declared free education [for primary and secondary phases] schools are now too full - so our successes have also become our problems. The four years have not been easy. When we took over [in 2015] we inherited or we came with massive deficits - about N$3 billion. So we started off with cash flow problems, but we took drastic actions that are helping us to get out of the woods now. We also addressed issues of corruption, quietly. Firstly, we cancelled the airport project that spiraled from N$3 billion to N$7 billion. I said 'how could the big gap be justified'? The Chinese took us to the court and we lost the first round. We fought on and won the second round in the Supreme Court. We also investigated the issue of the oil storage facility, which was quoted in US dollars instead of Namibian dollars. We paid nearly half a billion just in currency fluctuations. We came up with the Harambee Prosperity Plan, which is an idea and vision of a leader, not to replace all existing national development plans but to accelerate them. John Steytler, who has recently resigned, has been instrumental in this regard. I can confirm that Steytler and I definitely did not fall out and I am happy he confirmed that himself [recently in New Era]. Unfortunately the world economy went down and it affected us so badly that we couldn't implement the Harambee plan to the letter. Overall, we tried our best. NE: You often refer to the cancellation of airport tender as one of the highlights of your fight against corruption. Why has no one been held accountable so far in that matter, seeing how high accountability ranks on your to-do list? HG: Let me take you to waves of leadership. The first wave was of leaders was those extraordinary personalities, the founding fathers that were like gods. Then we have the second wave that emerged after the conclusion of the Cold War, characterised by military coups and so forth. Then we have a third wave, where you talk about processes, systems and institutions - not individuals. The process must be there to deal with those who are doing wrong things. Then you have institutions, like courts, ACC and so on. You cannot say nothing was done. If a minister has been removed, that's drastic action. People think that firing someone is the only way to act. Look at the [Bernardus] Swarbooi case, for example. He said what he said but we were tolerant and we followed a process. I called him in and said 'Comrade, you're misunderstanding the issue. We're not questioning the merits of your argument but the manner you're doing so.' I asked him, 'if you're so unhappy why don't you go?' Then he stood up and left. He even forgot his phone behind. We were giving him a second chance - you don't just fire. Then take the situation of Comrade Jerry [Ekandjo] and Comrade Pendukeni [Iivula-Ithana]. They were told they had a right to campaign for positions in Swapo. There were some attacks of government programs - not from Comrade Jerry. So I said to them, when you say government is like this and than, while you're a member of Cabinet, how are we going to reconcile all this? How are we gonna go ahead now, after what you have said about government? They were given a chance. The principle in government is that we may disagree on principles but once the majority have taken a decision, you have to be part of it. They just said they had a right to campaign. Up to now, Comrade Pendukeni is in parliament on my [president's list]. We don't just fire people for the sake of firing. But in the end, firing will come if you were given a chance to amend or resign. NE: Did you anticipate things to be this tough prior to your takeover? HG: My brother, you're forgetting that I was part and parcel of the first government. I was a prime minister tasked to set up the government and I nearly died. As President I came in after having worked with senior people that groomed me. I was part and parcel of the whole process, so this was nothing new. This one is tough but I know how to handle it. I have colleagues that are helping me. It's a collective approach. Very, very tough but we can handle it. NE: In your fight against corruption, we also learned that you had approached the Anti-Corruption Commission (ACC) to investigate some of your ministers. Please enlighten us on that. HG: Yes, when we get reports of complaints, I like to consult. I called the ministers and I said 'this is what is being said about you'. Some of them got very annoyed. And then I followed up with letters. One of the issues contained in the ministers' performance agreements is good governance and ethical behavior, so when something is wrong we ask them. I am not targeting them. I didn't charge them but I asked them 'this is what is being said about you, what do you have to say?'. They all replied defending themselves but since I am not a judge, I handed this information to the ACC to investigate further. What I did in the meantime is removing them from the ministries they were at and some of them were very angry. It's nothing personal, but we're in this government to deliver goods. If you're accused, you must clear your name - it doesn't break friendship. NE: One of your early focus points was around governance. What are some of the successes scored on this front so far? HG: We have done things like changing the names of permanent secretaries as part of improving governance. For too long they felt they were untouchable. Some of them were even telling ministers that 'ministers come and go but we're here permanently'. The idea was to change the mindset. There's also greater attention to timekeeping. Cabinet ministers know that if we're starting at 09h00, they have to be there by exactly that time. We also consult a lot - collective responsibility. The world over, politicians do not enjoy much trust. To get more trusted you have to be transparent. That's why I coined the slogan that accountability plus transparency equals trust. We try to be accountable and transparent. Unfortunately with the current economic headwinds, perpetuated by the current droughts, some of our plans cannot be fully achieved. We took cuts and contained wastage. International trips have been cut too - it was necessary to take these steps. NE: Speaking of headwinds, what is government's plan to get the economy out of the current doldrums? Cutting costs in one thing - but what is being done to help the economy grow again? HG: We have Harambee Propserity Plan and we have been assessing where it failed and where it succeeded. For now, youth unemployment has been identified as the key, and youth are the future of this country. At Cabinet this week we have directed that the new budget [2019/2020] must reserve a stimulus budget targeting youth employment projects. We're also talking to business people currently. We are trying to call a work economic summit. I am going to announce very soon a restructured President's Economic Advisory Council. I've reduced it to senior economists and so on. We're going to work with them to work out the stimulus package, aimed mainly at agriculture. NE: How badly are implementations of activities under the Harambee Prosperity Plan - and other national development plans - affected by the persisting economic slowdown? HG: I was so hurt when this beautiful plan started getting hit by the economic situation. But even the Millennium Development Goals did not meet their deadlines and they had to be reviewed. In the Harambee plan we're going to look at areas where maybe we were overambitious and make them a bit more realistic as per the current economic conditions. NE: And how has the economic conditions affect the implementation of duties given to you by Swapo in its 2014 election manifesto? HG: It was very difficult. First you don't have money and second, investors are not coming. Those that were coming here to get contracts from us, that's not investment. Real investments are like the Husab mine. It affected us and it was a setback. But we learned from it. We cannot be overambitious. We have to be practical. From that we will adjust and move on. NE: Is there anything that can be done internally to arrest the economic downfall? HG: The biggest elephant in the room is the government wage bill. Something has to be done. It's not affordable - it takes up close to 60 percent of the national budget. It's the one area government must tackle. Also, Cabinet is too big. When you are a new man coming in, a younger one, a peer group, it's always difficult. President Nujoma had authority of a founding father and liberation hero. He enjoyed respect and authority. When President Pohamba came in, you could see the difference. It's going more and more relaxed. With me, I took over at a time when anyone from my peer group could have taken over. And therefore pressure was more on me. What we did was to create a bit of balance in how you create Cabinet to accommodate [people]. If you have excluded people it could've been worse. But this is no more affordable. One way to cut down on the wage bill is to look at Cabinet. NE: At 43.3 percent of GDP, our public debt is above both our national threshold of 35 percent and the World Bank's cap for middle-income countries. What is being done to contain this situation? HG: That is the problem. When you're managing your debts properly, people don't realise it. Firstly, our debt stock is about 43 percent, while the Sadc average is 60 percent. So, Namibia's debt stock is still manageable. But we're not used to it. America is 100-and-something percent of GDP in debt, but they can pay. What is the composition of our debt, basically? About 62 percent of our debts is local, which is a good thing. About 20 percent or so is in bonds. Only two percent is Chinese debt but people think everything is Chinese debt. We haven't taken any debt from China since I came to office. What President Nujoma and I did when we came in  was to ensure we don't have any debts with IMF (International Monetary Fund) and the World Bank. We deliberately avoided them so that we're not told structural adjustments and so forth. Our debts are manageable. We're not playing around. We took deep cuts so that we manage this economy. NE: Does government has a repayment plan and can you assure younger people that you're not trapping them into debt by the time they take over? HG: We're always aware of the future generations and that's why we manage the economy the way we do. Our debt stock is predominantly local and thus manageable. On foreign debts we're looking at favourable terms so that we have a breathing space. NE: Kindly digest for us your declaration of accountability this year. In practical terms, what are you asking the nation to do? HG: Firstly I want people to appreciate the dreams of a leader. During the liberation struggle days, President Nujoma told us every end of the year at Swapo central meetings in the bush that: "Comrades, next year we're going to be on the outskirts of Windhoek." He has been saying that for at least ten years. A leader does that, a leader has to inspire. So you come with concepts. This is election year and as leaders we must account to the people at a supreme level. Those in government must account to me so that I account to the people. Ministers must account. Let's look back and say what did we do wrong and what could we have done differently? During campaigns, people would be asking us to account and we must be ready to answer them. I saw some local scholars saying there's nothing for which we must celebrate Independence Day this year. All countries have problems, but we certainly have reason to celebrate. The freedom we have is not appreciated. Yes we have poor people but there are also success stories. In the past, the towns of Omuthiya, Outapi, Eenhana and others did not exist but now they do. People travelling from Gobabis to the northern parts of the country no longer have to go through Windhoek. They can drive straight to Grootfontein because of the new road connecting the two towns. Outsiders appreciate our country but our own people do not. We definitely have reason to celebrate independence. NE: How prepared is Swapo for the upcoming national elections this year? HG: The party is composed of individuals. Some are using social media to paint a picture that the party is divided - but that's not the first time we're hearing this. People think Swapo has changed. Yes, the Swapo that I joined in 1962 in Tsumeb and the one I went aboard with and help build is not the same one today. It's a movement. Change is the only constant thing in the world. We are entering the Fourth Industrial Revolution, so even Swapo has to think of how to adjust to these changes. Swapo has always had fights. But we have congress. Not too long ago we've had congress - one of the toughest I've attended all my life. It looked like a campaign for national elections. Stakes were high. But once you're not elected, you have to accept that. Yours truly got 75 percent and that's a mandate. People don't realise how democratic this party is. It's tolerant and accepts its mistakes too. Just recently we dealt with the issues of the Rundu and Okahandja councillors. We called them and we resolved the matters and moved on. That's Swapo. Swapo will live on. We had the Shipanga crisis, the Muyongo crisis, the Ben Ulenga crisis... but here we are. NE: We now hear talks by some Swapo members about possibilities of having independent presidential candidates - possibly to challenge you this year. What's your take? HG: Don't forget I'm a political scientist. How do you field an independent candidate within Swapo? The party constitution is very clear that the candidate has to be the president of Swapo. To be an independent candidate you have to leave Swapo. Even then, you have to look at the Namibian constitution - it's not that simple. People have freedom to say things - stupid or clever.